Splash pages, you gotta' love 'em. A blank canvas where the artist can take the brakes off their pencils and hit the reader with a large dose of illustrated 'wow'. This week, it struck me in all the time I've been pumping out these Friday features, I'm yet to do the always amazing, constantly astounding Alex Ross, so let's kick that into touch right now. Stepping in to save a Superman who was pretty much screwed in the pages of Justice #5, Ross proves how awesome Billy Batson's alter ego is in one giant splash (even if Clark needs to raise his gaze a little). From saviour to mind controlled nasty, the splash that launched a thousand merchandising opportunities at DC still looks as cool today as it did first turning the pages of Kingdom Come Book 3. Gosh that's pretty. 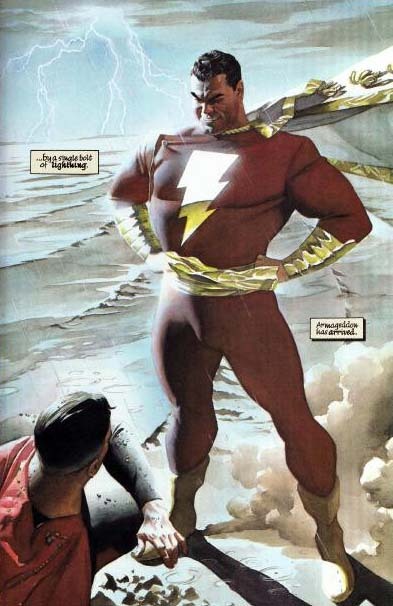 I could stare at Alex Ross's work for hours. He could be drawing anything, but he chooses comics, and for that I feel blessed. Thanks for reprinting it. I still shudder when I see Billy, even when he's good, because Mr. Ross did such a perfect job with him in that scene in Kingdom Come. He scares me now. Kind of like how clowns scare me ever since that scene in Poltergeist. Here it is another guy, wich art I am a devoted fan. Like Randomnerd said, we can watch a drawing for hours and hours. Thanks for that. Coolness, I like having those two pics contrasted like that -- both those series were great! It's just perfection. Really brings the characters to life. Gives them a depth you just don't usually get in the medium. 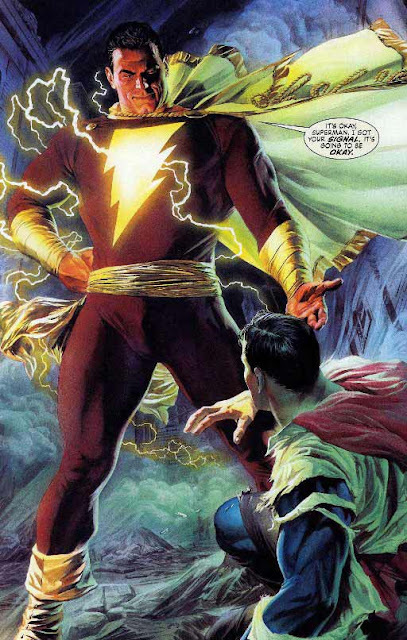 Yeah - I don't think I could ever tire of Alex Ross's work either folks. He has such a love for comics it just shines through in everything he touches. Like you say Aaron it's quite cool seeing the two spreads side by side (or in this case top to bottom), and seeing how just a few tweaks can change so much. I think that was part of the frightening thing RH - Cap's classic look is so heroic and happy, seeing him crackle with evil was the ultimate shiver to the spine for fans. Even clowns of the Joker find it hard to pull off that kind of 'we aren't going to survive this moment'. So folks what one frame of Alex's work stands out to you most when you think of his work?